If you want to start investing but you don’t know where to start. I want to show you five ways to save enough money so that you can start investing your money as soon as possible. Most people believe that it’s difficult to save your money but this isn’t true. You just need to take a good look at your financial situation and the services at your disposal to find the money you need. 1. Save up to R400 a month on insurance! – Many of us spend more on insurance than we should. You see, every year your insurer hikes your premiums even though your car is worth less. Most of us, me included, just never think about getting another quote. But it goes further than this. If you get a second quote and its better than your insurer currently offers, you should forward the quote to your current insurer. Playing them off against each other, can get you a great premium with minimum hassle. 2. Save up to R200 a month from things you don’t need! – All you need to do is go through your bank statements and look for debit order payments going off for things you don’t need. I tried this and discovered I was paying R95 a month for a helicopter rescue service I no longer used… It took me fifteen minutes and saved me about R1,200 a year! 3. 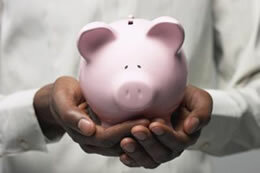 Pay off your credit card immediately and get accelerated savings! – The cost of credit card debt is as high as 20%, even 30% a year. So don’t put any money in the market, or even a savings account until you’ve paid off your credit card debt. On R20,000 credit card debt you save R4,000 to R6,000 in interest per year by paying it off instead of saving the same money in a fixed deposit that’ll gives you at most R1,000 a year in interest. After you’ve paid off your credit card you can start saving money and investing in penny shares! 4. Get your bank to pay you for banking with them! This is a really easy one – use bank loyalty programmes like the FNB EBucks and Nedbank greenback programmes to your advantage. Use these rewards t pay for things like petrol and food. And then take the equivalent amount and put it away for savings. Following these five tips should make it easy for you to save up as much as R10,000 or more this year, and possibly as quickly as in four months!